How small can a gaming PC be? Pretty darn small if AMD has anything to do with it, as the company is pushing forward with a small form-factor machine by the name of Project Quantum. This exciting initiative, which makes good use of the much slimmed-down size of AMD's Fury X graphics card, was first revealed back at the E3 video game trade show in June. However, further news has now emerged regarding the project, with a teardown popping up online. 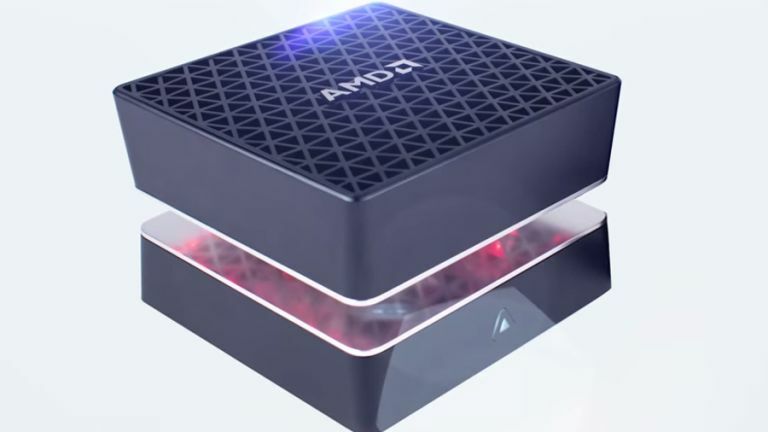 AMD provided PC World with one of its compact (9.5-inch square, 6.5-inch tall) gaming rigs, the 'number five' demo prototype (of 12 or so) in fact, which had died during its tour of presentation duty, so the tech site could rip the thing apart and see what's inside the aluminium chassis. So what did they find? A unique cooling system for starters, and indeed Project Quantum boasts liquid cooling with a radiator, pump and custom 3D-printed reservoir. The PC actually consists of two main compartments, and one compartment is entirely dedicated to this nifty cooling system. Of course, keeping a tiny machine packed with high-spec hardware cool isn't an easy task, so it's not surprising to see a focus on such heavyweight cooling. Also, the PSU is an external power brick, to help save space, and of course to keep the internal temperature down. So what are the aforementioned high-spec components in the second section of the machine? PC World found a Fury X GPU, a stock Fiji XT card – just the one, although Project Quantum is allegedly capable of hosting twin cards for truly blazing performance – along with a Radeon branded SSD (really an OCZ model). As for the CPU – well, it's not an AMD chip. In fact, the company has run with an Intel Core i7-4790K, and it's sat in a heavily modified Asrock Z97E-ITX/ac motherboard. The end result is something of a miniature miracle of PC engineering, and packing all this into such a small chassis is definitely an impressive feat. As drool-worthy as all this may be, bear in mind that Project Quantum is still a concept, and whether AMD will make it a commercial reality remains to be seen. But it certainly bodes well for the future of portable and powerful PCs.